Building Information Modeling (BIM) has seen an unprecedented uptake in the Dutch Architecture, Engineering and Construction (AEC) industry. BIM includes both software to manage essential building design and project data as well as project management related tools and methods. It is frequently seen as a means to reduce failure costs and increase productivity. These rapid BIM developments and wide industry support highlight the need for a systematic overview of the current state of the art of BIM in the Netherlands. 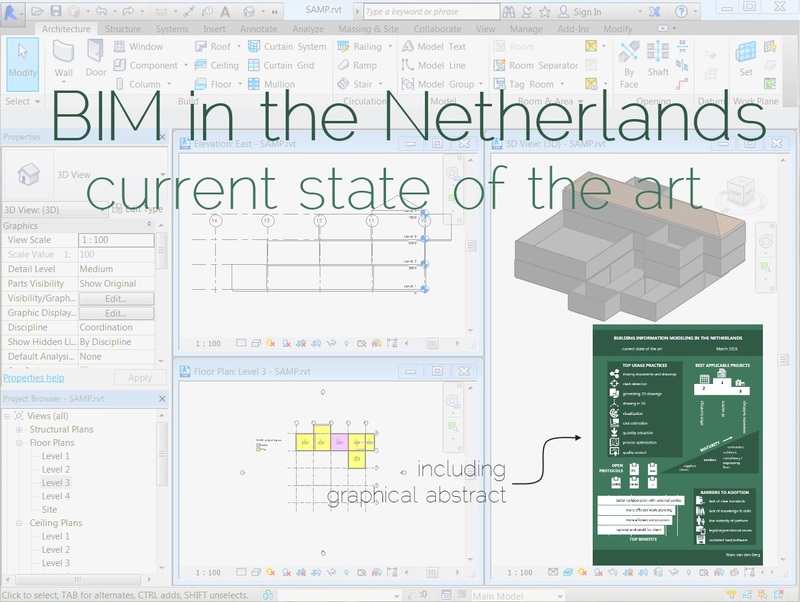 I have synthesized earlier academic and non-academic work on BIM in the Netherlands in a recent research deliverable. Below are the main findings. The Netherlands has seen several initiatives to share and foster BIM best practices across the industry, such as the foundation of the Bouw Informatie Raad (that pursues a successful transition to building with BIM), BIMregister (that collects, develops and share BIM knowledge) and BIM Loket (that promotes open BIM standards) and the organization of several practice-oriented BIM conferences every year (such as the BIM Praktijkdag I wrote about earlier). According to one survey, the Dutch AEC industry mainly uses BIM for sharing documents and drawings, clash detections, generating 2D drawings, drawing in 3D, visualization, cost estimation, quantity extraction, process optimization and quality control. The industry – as a whole – has demonstrated being able to perform these BIM tasks with a fairly high quality, repeatability and degree of excellence. That is: BIM maturity is fairly high in the Netherlands. Two independent studies, the BIM Quick Scan and the BIM maturity sector analysis, thereby consistently showed that clients and suppliers have the lowest maturity levels of all building parties, while consultancy and engineering firms and contractors have the highest. These maturity models are not consistent in the aspects in which companies score low (or high). Fostered by large public clients (such as the Central Government Real Estate Agency) who prescribed the use of BIM, the Netherlands also has one of the highest BIM adoption rates in the world. Architects are described as the forerunners, particularly in comparison with their European colleagues. Contractors and installers have been adopting BIM at an increasing rate, with the first group starting to use BIM earlier (due to their position in the supply chain). Suppliers of construction materials seem least ready to use BIM: their adoption is lowest. BIM adoption is not limited to a number of high-profile large-scale projects. According to Dutch contractors and installers, BIM can be applied best in all subsectors of the AEC industry. After that, they think BIM is most suitable for projects concerning office buildings (such as to better deal with complexity) and for residential buildings (such as to reap benefits from serial production). BIM is furthermore increasingly used in (large) infrastructure projects. The frequent BIM use is in line with the many benefits that organizations attribute to it. Contractors and installers report as most important benefits a better collaboration with external parties, more efficient planning and construction and an optimal end result for the client. Other benefits that organizations attribute to BIM are better management of expectations, more pleasure in work and professionalization, less mistakes, shorter duration of design and construction stages and competitive advantages. A number of open protocols (or standards) for processes, data formats and/or semantics are in use that support the extent to which BIM systems can exchange, interpret and share data. As such, IFC is an international standard for sharing model objects and their properties between several software applications. VISI is a Dutch standard that forms the basis of communication and information exchange between building parties. COINS refers to a Dutch integrated, complementary standard for exchanging digital information and with support for Systems Engineering. CB-NL is a Dutch standard that connects object libraries for objects and spaces in the built environment. Several barriers currently hinder broader implementation and dissemination of BIM within the Dutch AEC industry: a lack of clear standards, a lack of BIM knowledge and skills among professionals, low BIM maturity levels of project partners, some legal and organizational issues and outdated ICT infrastructures. It is hoped that this overview of BIM in the Netherlands is helpful to guide future BIM investments and developments.